Hampton Court Palace is a former royal palace that has been open to the public since 1838. It is located in Richmond upon Thames, in Southwest London. Today, Hampton Court Palace is a popular tourist attraction. It is especially known for its distinctive architecture, for the collection of art and furnishing displayed (which are from the Royal Collection), for its maze and formal gardens, and for the astronomical clock in the Main Gatehouse. Additionally, an ice rink is normally set up in the forecourt of the palace from early December to about mid-January. This fully illustrated study of what is `probably Britain's most important secular historic building complex' is based on the premise that the architecture of Hampton Court cannot be understood without a consideration of the agendas of the remarkable people who built it. Soundly based on a multitude of sources, including many original plans and surveys as well as recent archaeological evidence, the book begins with the earliest Court built by Lord Daubeney in the 15th century; a structure that has almost entirely disappeared. Thurly goes on to examine the plans and structures of Cardinal Wolsey, Henry VIII and the Tudors, demonstrating how the `rapid and sometimes astonishing turns in Henry's private life' impacted on his building programme at Hampton Court. The book compares and contrasts the use of the Court by the Stuarts, who largely regarded it as a place for entertainment and hunting, before examining its transformation under William and Mary who saved it from a long decline. The evolution of the gardens, the embellishments of the Georgians, the destruction of the Victorians, the influx of tourists and the conservation efforts of today are all illustrated and authoritatively discussed by the Chief Executive of English Heritage. Hampton Court Palace, to the south-west of London, is one of the most famous and magnificent buildings in Britain. The original palace was begun by Cardinal Wolsey, but it soon attracted the attention of his Tudor king and became the centre of royal and political life for the next 200 years. In this new, lavishly illustrated history, the stories of the people who have inhabited the palace over the last five centuries take centre stage. Here Henry VIII and most of his six wives held court, Shakespeare and his players performed, and Charles I escaped arrest after his defeat in the Civil War. William III and Mary II introduced French court etiquette, and Georgian kings and princes argued violently amid the splendid interiors. Alongside the royal residents, there have been equally fascinating characters among courtiers and servants. Queen Victoria opened the palace to the public in the nineteenth century, and since then millions of visitors have been drawn to Hampton Court by its grandeur, its beauty and the many intriguing stories of those great and small who once lived here. From King Henry VII to Queen Elizabeth I, this detailed English history brings the past to life through the sights and personalities of the Tudor dynasty. This lively and engaging book will transport the armchair traveler with a taste for the colorful time of Henry VIII and Thomas Moore to palaces, castles, theaters, and abbeys to uncover the stories behind the politically dynamic Tudor era. Author Suzannah Lipscomb visits more than fifty historic sites, from the luxurious palace at Hampton Court, where dangerous intrigue was rife, to lesser known estates such as Hever Castle, Anne Boleyn’s childhood home, and Tutbury Castle, where Mary, Queen of Scots, was imprisoned. In the corridors of power and the courtyards of country houses, we meet the passionate but tragic Kateryn Parr, Henry VIII’s last wife, and Lady Jane Grey, the Nine–Days’ Queen, and we come to understand how Sir Walter Raleigh planned his trip to the New World. A Journey Through Tudor England reveals the rich history of the Tudors and paints a vivid, captivating picture of what it would have been like to see England through their eyes. It is “a genuinely useful and discriminating guide for all Tudor fans” (Hilary Mantel, author of Wolf Hall). Hampton Court Palace has the finest Baroque park and garden layout in Britain. Set within 2,000 acres of parkland and bounded on its south and east sides by the River Thames, the historic landscape possesses a rich overlay of garden improvements from the early 16th to the 21st centuries. This book explores the history of this landscape. Among the many themes it addresses are the role and impact of patrons, designers and estate workers; planting and horticultural techniques; statuary, fountains and other garden ornaments; and maintenance and conservation. The photographs by Vivian Russell that accompany the text constitute the most comprehensive topographical survey of the palace's gardens since the late 18th century. Welcome to Hampton Court Palace, home to some of Britain's most famous kings and queens and the setting for many great events during nearly 500 years of royal history. 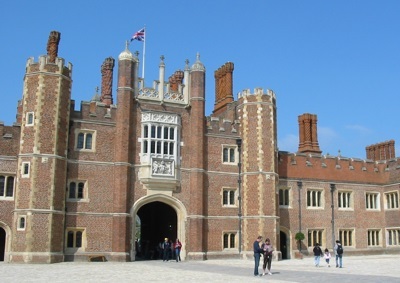 Viewed from the west, Hampton Court is still the red brick Tudor palace of Henry VIII (1509-1547); from the east it presents the stately Baroque facade designed by Sir Christopher Wren for William III (1689-1702). The sumptuous interiors reflect the different tastes of its royal residents and are furnished with great works of art, many still in the positions for which they were originally intended. Hampton Court Palace, with its beautiful gardens and extensive parkland, set by the riverside, is both visually and historically enthralling. A walk around will intrigue, amaze and delight. Beautifully illustrated. 76p. Large french flaps, with plan of the space inside front flap. Hampton Court Palace : Souvenir Travel Guide Book. The Historic Royal Palaces bring six palaces and their stories to life: the Tower of London, Hampton Court Palace, the Banqueting House, Kensington Palace, Kew Palace and Hillsborough Castle. 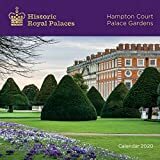 This calendar features 12 beautiful shots, celebrating all of the seasons from the gardens of Hampton Court Palace. Informative text accompanies each work in this art calendar and the datepad features previous and next months views. Contents include: Tudors, Stuarts, William and Mary, Neglected Years, The Palace Today, Courtyards & Cloisters, Tudor Palace, State and Private Apartments, King's Private Apartments, Cumberland Suite, Prince Wales' Apartments, Mantegna Gallery, The Palace Gardens, and Plan of the Palace and Gardens.